With a stay at Hotel Exe Plaza in Madrid (Tetuan), you'll be steps from Paseo de la Castellana and 3 minutes by foot from Plaza de Castilla. 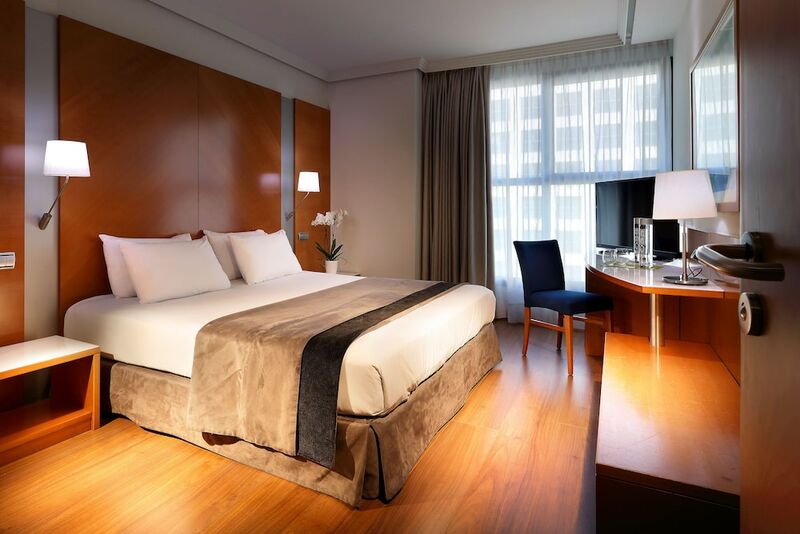 This 4-star hotel is 1.5 mi (2.4 km) from Santiago Bernabeu Stadium and 3.5 mi (5.7 km) from Paseo del Prado. Make yourself at home in one of the 262 air-conditioned rooms featuring minibars and flat-screen televisions. Complimentary wireless Internet access keeps you connected, and satellite programming is available for your entertainment. Bathrooms feature bathtubs, complimentary toiletries, and bidets. Conveniences include phones, as well as safes and desks. Be sure to enjoy recreational amenities, including a spa tub, a sauna, and a fitness center. Additional features at this hotel include complimentary wireless Internet access and concierge services. Enjoy a meal at the restaurant or snacks in the coffee shop/café. The hotel also offers room service (during limited hours). Quench your thirst with your favorite drink at the bar/lounge. Buffet breakfasts are available daily from 7 AM to 11 AM for a fee.